If you're on the lookout for a casual yet stylish ensemble, go for a white coat and grey skinny jeans. Both garments are totally comfy and will look fabulous paired together. When it comes to shoes, this ensemble is complemented nicely with Clergerie bianca platform loafers. If you're a fan of relaxed dressing when it comes to your personal style, you'll love this totally stylish pairing of a beige oversized sweater and black and white vertical striped leggings. You could perhaps get a little creative when it comes to footwear and lift up your getup with Clergerie bianca platform loafers. Dress in a charcoal coat and light blue ripped boyfriend jeans if you're scouting for an outfit idea for when you want to look casually cool. Got bored with this ensemble? Enter Clergerie bianca platform loafers to spice things up. If you're obsessed with practicality dressing when it comes to fashion, you'll love this absolutely chic pairing of a light blue denim jacket and black leather leggings. You could perhaps get a little creative when it comes to footwear and dress up your ensemble with black leather platform loafers. If you're hunting for a casual yet totally stylish outfit, try pairing a black and white check coat with navy sweatpants. Both garments are totally comfy and will look fabulous paired together. Clergerie bianca platform loafers from farfetch.com will bring a classic aesthetic to the ensemble. For a casual totally stylish getup, team a charcoal coat with black fringe dress pants — these two pieces fit perfectly well together. 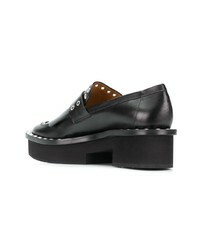 When it comes to shoes, this ensemble is round off brilliantly with Clergerie bianca platform loafers from farfetch.com. This pairing of an olive trenchcoat and charcoal boyfriend jeans is impeccably stylish and yet it looks comfortable and apt for anything. Lift up your ensemble with Clergerie bianca platform loafers. If you're on the lookout for a casual yet totally stylish ensemble, make an olive double breasted blazer and olive tapered pants your outfit choice. Both garments are totally comfy and will look fabulous paired together. Clergerie bianca platform loafers from farfetch.com are a nice choice to complement the look. For a smart casual outfit, consider wearing a beige leopard fur coat and a black mesh midi skirt — these pieces fit pretty good together. When it comes to footwear, this look is finished off wonderfully with Clergerie bianca platform loafers from farfetch.com.